In a recent recipe, I referred to “Strong flour”. A couple of followers from Canada and the USA queried what this meant. 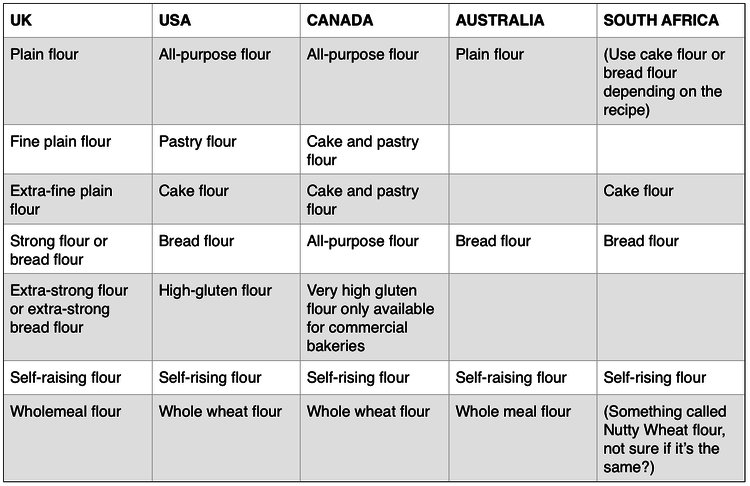 I was aware that there were differences in what flours are called around the world, but once I started looking into it, I discovered it was even more complicated than I had realised. So I’ve put together a guide here to the different types of wheat flour, which I’ll also make into a permanent page and link to it whenever I post a recipe with flour. Chart compiled by Vanessa Chapman – Feel free to correct me or fill in any of the gaps! This is by no means a fully comprehensive or definitive guide, there are other types of wheat flour, and even within the above categories there will be variances in grade and properties of flour depending on the variety and where it is grown which will give differing results. Apologies to the countries I haven’t included. – One of the main differences in the types of wheat flour is the gluten (gluten is the protein in many cereal grains). Flour made from harder wheat has a higher gluten content and that is what gives it the elasticity needed for bread making, also for certain pastries that need to stretch such as choux pastry. Lower gluten flours tend to be lighter and better for cakes and suchlike. 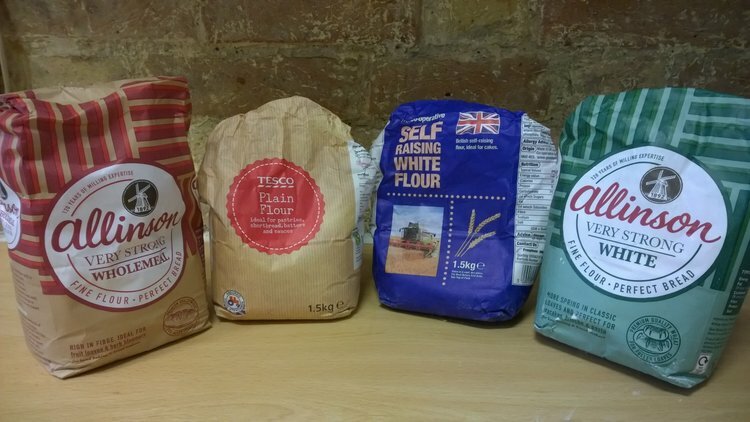 I believe that the word “strong” used in UK bread flour simply refers to the stronger chains of gluten that are developed when kneading the dough. – Take care not to confuse bread flour with bread mix, they are not the same thing. – Canadian flour is considered by many (especially Canadians!) to be the finest flour in the world (I believe in France they disagree!). All-purpose flour in Canada really is all-purpose, suitable for bread and cake alike. This differs from all-purpose flour in the states which really isn’t ideal for bread, although apparently, all-purpose flour from certain US states does make good bread (I told you it was complicated). – Self-raising/self-rising flour is just regular flour that has had raising agents added to it. Professional bakers tend to avoid this type of flour, preferring to control the amount of raising agents themselves. – Flour in the UK tends to be a little moister than flour in the USA and so slight adjustments to the liquid quantity in recipes may be needed. – In the UK, USA, and Canada (not sure about other countries), white flour is, by law, enriched with vitamins and minerals to make up for what is taken out during processing. What is lacking in white flour is the high fibre content of wholemeal/whole wheat flour. Apparently however, on the plus side, the fibre content of wholemeal/whole wheat flour means that it passes through you quicker which doesn’t always allow time for the vitamins and minerals to be absorbed by the body; whereas white flour hangs around longer and the vitamins and minerals are therefore more easily absorbed by the body. So maybe I don’t need to feel TOO guilty about the fact that I much prefer white flour. – Wholemeal/whole wheat flour tends to go rancid more quickly and is therefore best stored in an airtight container in the fridge or freezer. Who knew flour was so interesting! Actually it was you that was the inspiration for including South Africa! Although the information I was able to find was quite limited compared to the other places up there. I wonder if the differences between the flours explains why we can make something that works really well one time and then fails the next time – or we follow a recipe we find where the person is raving about how well it works, but it just doesn’t for us! From now on if I bake something that works really well I’m going to note exactly which type and brand of flour it is so that I can reuse the same one next time. Of course years ago they wouldn’t have had the big choice of flours we have now would they. Everything comes with more choices now. Even buying toothpaste is difficult! Back in my day when I still cooked, I never was an educated or fancy cook and I never made yeast bread in my life – just cakes, cookies, and quick-breads – so I never used anything but all-purpose flour. I could make some pretty tasty stuff, though! I’ve only really started making yeast bread relatively recently, I’d made it a very few times in the past, like at school! But now I’ve discovered how therapeutic kneading dough is, I love it! It was quite fun to do actually. Recipes are an interesting thing really because these days recipes are shared around the world, and yet there are so many differences in what ingredients are called, or what is available, not to mention the different ways they are measured – I wish it was all standardised! So is stone-ground the best production method for every flour type, oh guru-of-the-kitchen?! !